Our materials address the common core standards. Each workbook requires a close reading of the text. 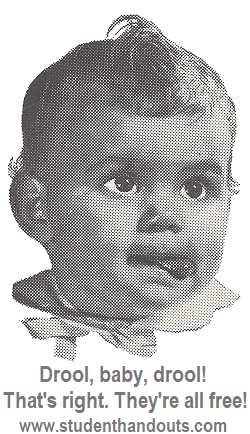 Following each small segment of reading, there are text-dependent questions. These questions range from basic recall to critical thinking; there are even contextual vocabulary-themed questions that not only improve students' vocabularies, but help prepare them for the ACT/SAT. These workbooks are truly cross-curricular, and utilize reading across the curriculum. They are popular among everyone, from those teaching special education students with reading comprehension difficulties, to those teaching AP-level high school students of American History, World History, and European History. They are suitable high school history students. We recommend aligning the workbooks with your current Social Studies content. Review by Sharon B. 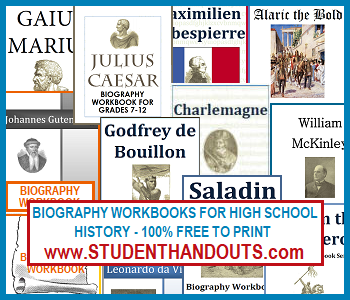 - I love using these biography workbooks. We have a history curriculum that we are following and study together with our sons. Then I give these workbooks for the boys to work individually and on their own time. They are able to practice highlighting, taking notes, and writing short answers. I will [download] any and all workbooks available, and I highly recommend them to other families. Review by Cheryl H. - This was a fantastic ebook. We had never heard of Olaf Tryggvason, and it came at a time that we were studying the country he was born in. We liked how it read like a good story, but with so much information-as well as questions, etc. Great biography!! Review by Melody K. - Wow! What a great resource! These are great booklets that are presented in a pleasant format. The review questions are placed at intervals within the text. This makes it great to find a good stopping place for the day. It also takes the guess-work out of the equation, eliminating the "which questions should I assign for what section" confusion. This topic is a particular favorite of mine and I was able to share it with my children in grades 5 and 10 who also seemed to really enjoy it! I highly recommend it to any student grade 5 and up. Review by Pamela S. - Leonardo da Vinci by Student Handouts is short (19 pages) but consists of history reading, extensive vocabulary words and numerous reading comprehension questions. This item also has one page of map work in order to complete this biography of Leonardo Da Vinci. Best suited for middle/high school students, this item is 5 stars for its compact study of an important figure in history.